This month I have two cases to use your image shift and SLOB (Same-Lingual, Opposite-Buccal) information. 1. The object in question is the metallic restoration on the canine. Which surface of the canine (buccal or lingual) is it located on? 2. 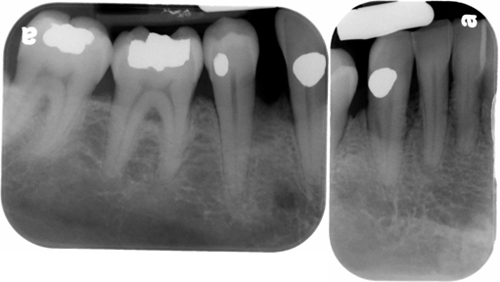 The object in question is the broken endodontic file (orange arrow) in the first molar. Which root (buccal or lingual) is it in? Answers coming Thursday, April 17. You can answer either in the comments, twitter (@DrGstoothpix) or wait. If you have any questions, please leave them below. Thanks and enjoy! but mam how to decide in which direction tubehead has been moved? This is where you need to be able to visualize the positioning of each radiograph if using the image shift principle. Using the first set of radiographs, the posterior periapical radiograph would have approximately 45 – 50 degree horizontal angle. When you move to the anterior periapical, the horizontal angle decreases to approximately 30 degrees. This moves the source of radiation anterior which will project objects posterior on the radiograph. Does this help you get started? K i have understood. Plz put more cases so that i can practice more. thanx for guiding me.